The reason for Localised Ultrasonic Fat Loss Procedures. What is Ultrasonic Cavitation and why it is combined with Radio Frequency treatments? 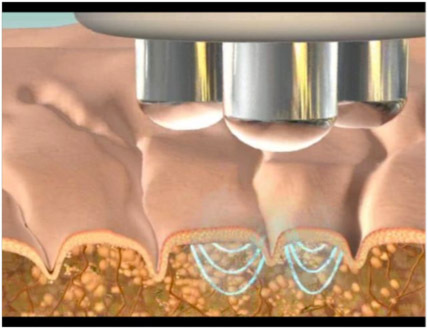 The basic principles of Lipo-Cavitation and why using 40 KHz. Tripolar Radio Frequency used in conjunction with cavitation. If you are trying to get in shape for the upcoming holiday party season but dieting and exercise aren’t doing much for your problem areas, there might be a reason. Traditional weight loss methods can cause your body to go into conservation mode, which slows your metabolism and actually makes it harder to shed fat. Fortunately, advances in science have found a way to diminish fat without sending your body into panic mode. There are many fat loss and fat reduction procedures available, but some are more invasive than others. If you are already active and eat healthily, but have areas of your body that just do not seem to respond to diet and exercise, Lipo-Cavitation maybe an option to consider to get the body you want. It is a non-invasive procedure that helps your body release unwanted fat cells with the aid of ultrasonic waves. This type of procedure is not meant to be the substitute for a healthy diet and constant exercise. These are the only sustainable answer to keeping a good physique and remaining healthy in the long run. Any cavitation treatment is meant to be used in conjunction with a good dietary regime and an active lifestyle. What is Ultrasonic Cavitation and why it is combined with Radio Frequency treatments. This type of aesthetic procedure goes under a number of different names. Ultrasound Cavitation; Cavitation; Ultra Cavitation; Body Contouring; Body Sculpting;Ultrasonic Cavitation etc. Ultrasound Cavitation is a process where the power of ultrasound naturally breaks the fat cells in a localised area of treatment and then allows the body to naturally move the fat and toxins from the area out through the body’s natural detoxification process. When combined with Tripolar radio frequency (RF) you also tighten, tone the skin reducing sagging, wrinkles and the appearance of cellulite. The term “Ultrasonic” refers to sound frequency which cannot be perceived by the human ear. An Ultrasonic Cavitation hand-piece (transducer) will make a sound we cannot hear while it is vibrating. We measure the vibration times per second as sound frequency, and refer to this as Hertz. Humans can hear from 20 hertz to 20,000 hertz. We are unable to hear anything above or below these levels. Therefore sound-waves with frequency above 20,000 hertz we call Ultrasonic. Ultrasonic Cavitation is essentially a treatment that involves powerful sound waves, which are forced into the fat cells. It is generally a professional fat-loss aesthetic procedure that is performed in cosmetic clinics and SPAs. It is non-surgical and does not require any anaesthesia and it is merely a non invasive aesthetic treatment. 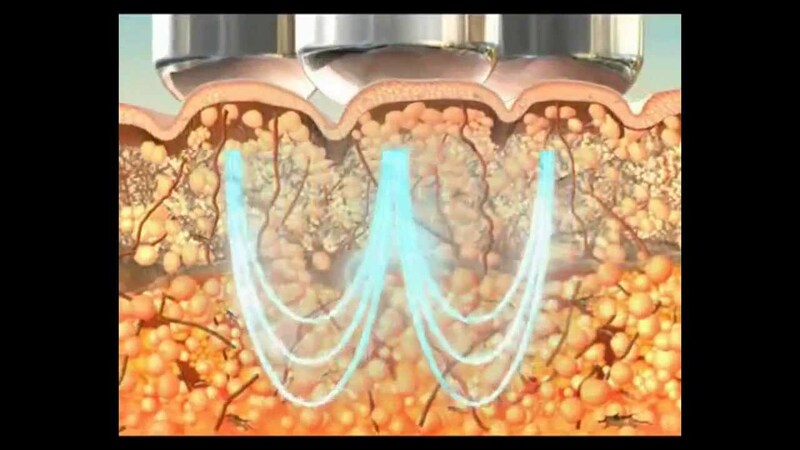 The ultrasound device used in Lipo-Cavitation is called transducer, and it is calibrated to only target fat cells (we will see how this is done later in this section). 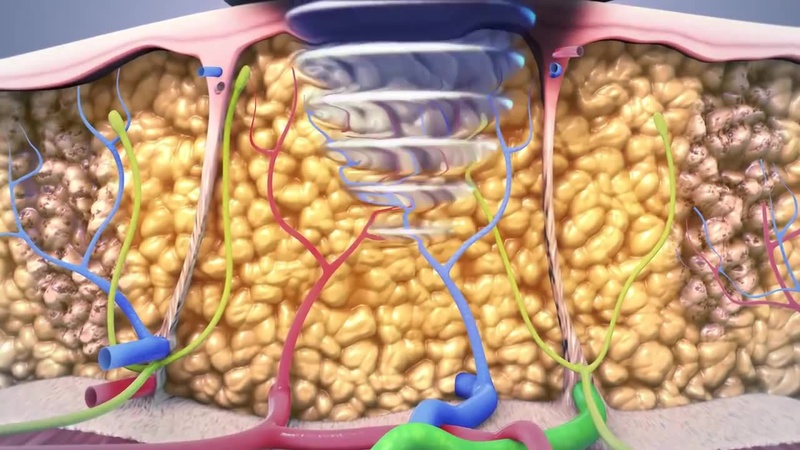 When the ultrasonic waves are directed towards the area of fatty tissue, they break the fat cell membranes. Because the device is calibrated to only target fat cells, no other damage will occur to surrounding tissues or organs. At certain frequencies, the vibrations caused by the sound waves, produce a strong wave of pressure to fat cell membranes. Usually a fat cell membrane cannot withstand this pressure, it will break spilling its fatty content. This liquid product leaves the body through the normal channels of the body’s metabolism. During the procedure, ultrasonic waves begin to break down the fat cells being targeted. This causes them to release triglycerides and other fatty substances that are a key component of the flabby tissue. 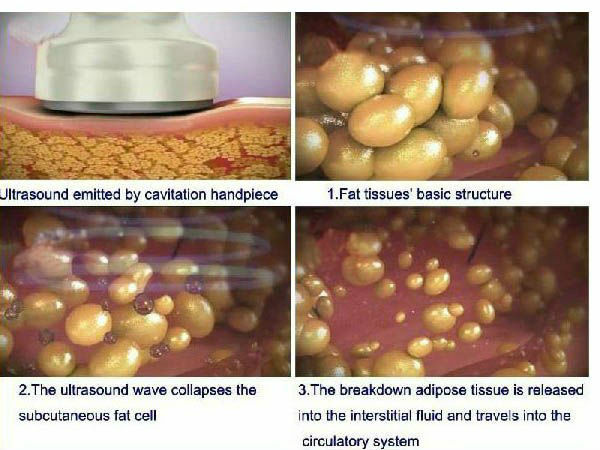 During the week after a lipo-cavitation treatment, the body will process the excess triglycerides and fatty substances through normal physiological processes. The waste material of the broken fat cells is then processed through the liver and released from the body through sweat and digestive elimination. 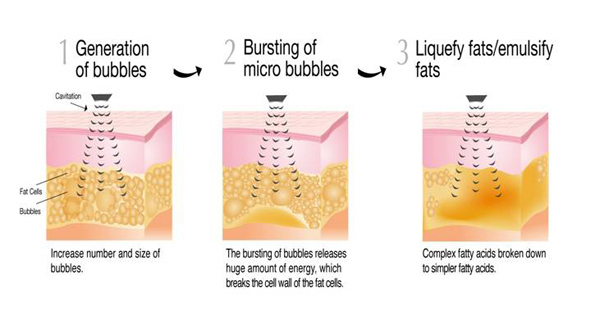 As mentioned previously the ultrasound waves of lipo-cavitation treatments targets only the fat cells. How is it possible to target the fat cells only and break them down? But how is this done? 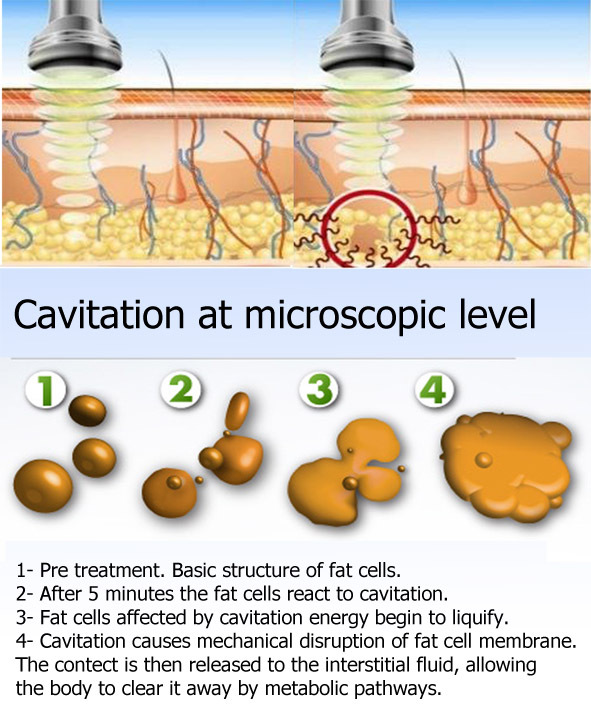 The main operational frequency of the transducer is the key to how the lipo-cavitation device can target the fat cells. 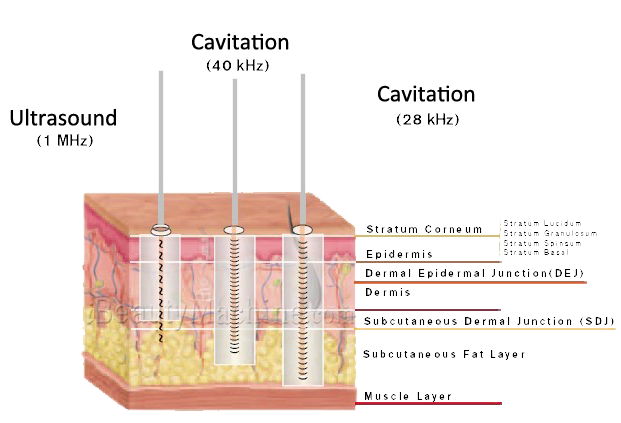 Also 40 kHz only resonates only with the fat cells without impacting the upper layer of the skin. The heat caused by the resonance of the fat cells is only confined to the adipose tissue and not the skin (Epidermis and dermis). In other words the epidermis and dermis are not affected by this type of ultrasonic treatment because of this particular frequency. 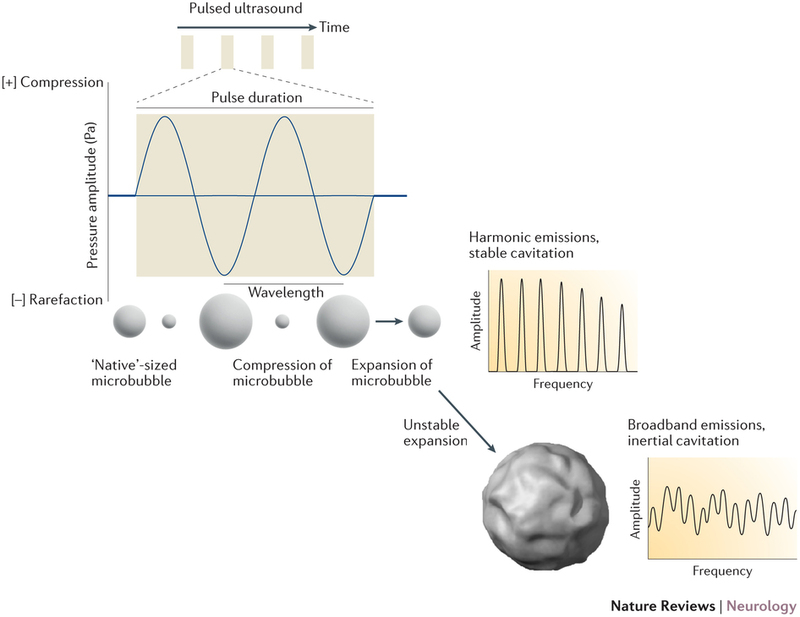 The fat cells resonate at 40kHz, this means that when they are subject to this sound frequency they will vibrate in tandem with the compression wave of the ultrasound device. The schematic below will help you understand the concept more easily. Tripolar Radio Frequency (RF) technology is an innovative, simple to use and extremely efficient aesthetic treatment which is combined with Cavitation to deliver visible body and facial tightening and rejuvenation effects from the first treatment. The two different types of treatments (Ultrasound Cavitation at 40KHz and Tripolar Radio Frequency) treatments are combined in order to deliver the best body contouring results possible. Tripolar Radio Frequency painlessly delivers focused and optimal radio-frequency (RF) energy into the skin and to subcutaneous fat layers. Controlled energy is delivered via three or more electrodes and limited to the treatment area. This focused delivery results in enhanced results from the Ultrasound cavitation treatment. Tripolar Radio Frequency treatments allow the aesthetic practitioners to improve on the results achieved with Cavitation treatments. Targeted body treatments shrink the fat cells in the hypodermis layer, helps the elimination of the fat and accelerate collagen regeneration and stimulate collagen fibres regeneration in the dermis layer. 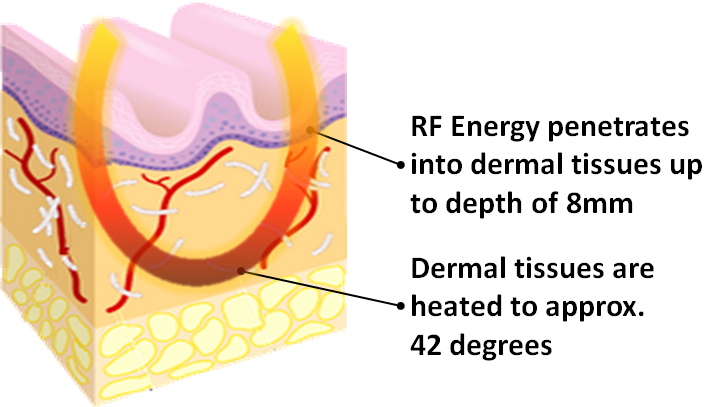 Since both 1st generation mono-polar and 2nd generation bi-polar RF technologies are not focused, they usually require much higher energy to achieve results which heats the skin that is near the electrodes. This sometimes causes discomfort and sometimes pain. Tripolar technology enables treatment of fine lines and very delicate areas of the face without causing damage or pain. These include areas around the lips (peri oral) and around the eyes (peri orbital). The elastic fibres of the skin, collagen and elastin, are produced by fibroblasts. As they are heated, they contract and collagen strands are pulled closer resulting in immediately tightened skin. The deep heating effect in turn accelerates the fat cell metabolism to augment collagen regeneration over the full treatment course. The desired result: tighter, younger looking skin immediately and long-term skin remodelling. Heating the fat cells accelerates metabolism and causes them to shrink. The rise in temperature forces fat cells to secrete fatty acids (liquid fat), which are disposed via the blood and lymph system.The desired result: fat and circumference reduction and minimised cellulite appearance.